I can’t be the only person who finds Facebook advertising confusing. All the features make it a very powerful advertising platform, but they also add complexity. One of the things I used to get particularly frustrated by is pixels. Pixels are common across most advertising platforms. They’re used to drop a cookie that will track visitors on your website so you can advertise to them later. This is called retargeting. Once you advertise to past website visitors, pixels can also be used to track their behaviour when they’re back on your website. This helps you measure the effectiveness of your ads. 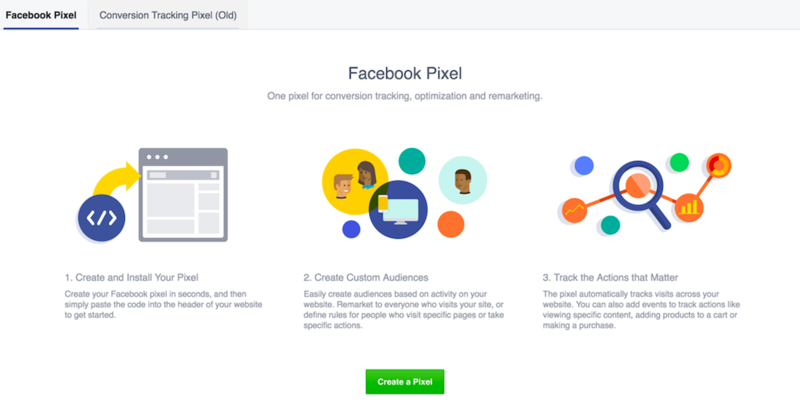 Facebook used to have a custom audience pixel for retargeting website visitors, and conversion pixels for tracking website conversions such as sales. 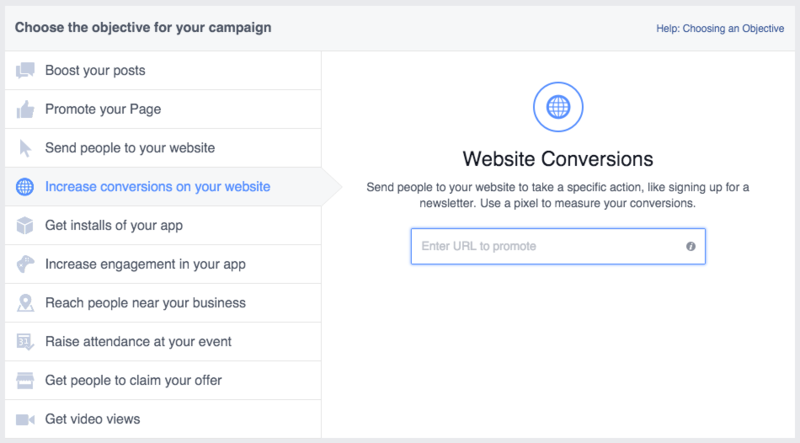 While each advertising account had only one custom audience pixel, you could create many conversion pixels—one for each web page you wanted to track conversions on. The thing is, although these pixels are confusing, they make advertising on Facebook much more effective. Not only do you know exactly who you’re advertising to, you also have a better understanding of how your ads are performing. All in all, you can make your messaging much more effective, leading to a better return on your advertising dollars. 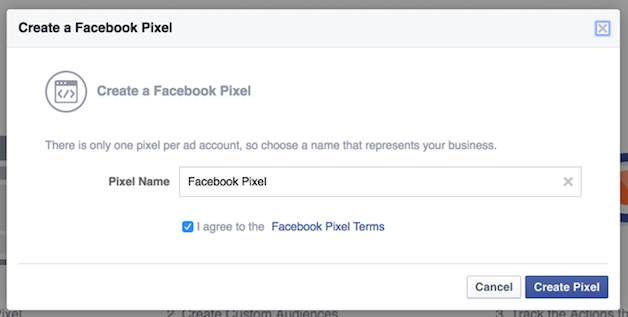 In 2015, Facebook took a huge step towards to simplifying this process by introducing the new Facebook Pixel. One pixel to replace all of them. The new pixel is now the only pixel you need. It has retargeting, optimization, and tracking all built in one. If you’ve been using the old pixels (and good for you if you have!) they will still work for the time being. Your old custom audience pixel has already been upgraded to the new pixel, but your conversion pixels will be phased out in the second half of 2016. My recommendation is to switch everything over now rather than leaving it to the last minute. And if you’ve never used any Facebook pixels before, it’s the perfect time to start. The new pixel holds a lot of value for ecommerce stores. It offers three core functions to help you get a better return on investment. Website Custom Audiences are how Facebook helps you retarget website visitors. If you have the Facebook pixel installed, it will track the movements of any visitors on your website who are simultaneously logged into Facebook. It will record which pages on your site they visit, which pages they don’t visit, and when they visit. Using this data, you can advertise to very targeted groups of people. people who have visited a specific page on your website but not another specific page. You can define Website Custom Audiences based on which pages they did or did not visit, and by when they visited your website. You can choose a timeframe of between 1 and 180 days. Audiences are created independently from ads. Once an audience is created you can choose when to advertise to it and which ads to use. Or you can let it percolate for future use. This means that you can create Custom Conversions independently of your ads, and then choose when to use them in the future. Because the new pixel already fires on all your website pages, it can easily track when someone visits a completion page—especially people who have clicked on your ads. You can also choose the type of conversion, such as “Purchase” and add a monetary value. For example, if you create a Custom Conversion that tracks visitors to an ebook download page, you can include the cost of the ebook. This feature will help you figure out if your ad campaigns are profitable. If you charge $20 for your ebook, but you’re spending $25 for every purchase that comes from Facebook ads, you’ll probably want to make some changes to that campaign. The interesting thing about Custom Conversions is that once one is created, it will be tracked for all your ads, whether you choose to optimize for it or not. All your Custom Conversions are always being tracked. At any time, you can create a report for one of your ads that will show the conversion rate for any of your Custom Conversions. If you want to optimize your ad for a custom conversion, choose “Website Conversion”, type in your domain, and then select the one you’re looking for. The drawback of Custom Conversions is that you’re limited to 20, and at this time, none of them can be deleted. If you’re tracking a lot of different completion pages, you could run into a wall. For that, you’ll need Standard Events. Standard Events are an advanced feature of the new Facebook pixel. If you only use Website Custom Audiences and Custom Conversions, you’re in great shape. In the 80-20 of Facebook advertising, you’ll already be doing the simple things that have the biggest impact. Standard Events function similarly to the old conversion pixels. You can create Standard Events with the new pixel, but much like the old pixel, they require a bit of extra code. One major perk of Standard Events is that they help get passed the limit of 20 Custom Conversions. While Custom Conversions are tied to a URL (usually for some kind of thank you or completion page), Standard Events don’t need to be. Instead, conversions can be tracked by adding an additional line of the code to the page of interest. 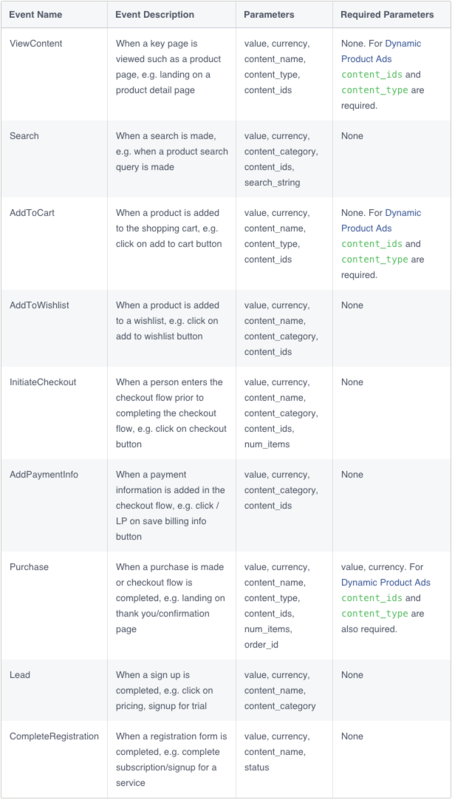 There are nine conversion types you can use with Standard Events, each with its own line of code. This code will tell Facebook what to track, and will be inserted into the new Facebook pixel code—but only on the page you want to track conversions on. The new Facebook pixel works similarly to the old custom audience pixel. It needs to be in the head section of your index page so that it appears on every page on your website. No matter what page gets loaded, the pixel will fire and track where the visitor is. First, if you haven’t already, you’ll need to create your Pixel. 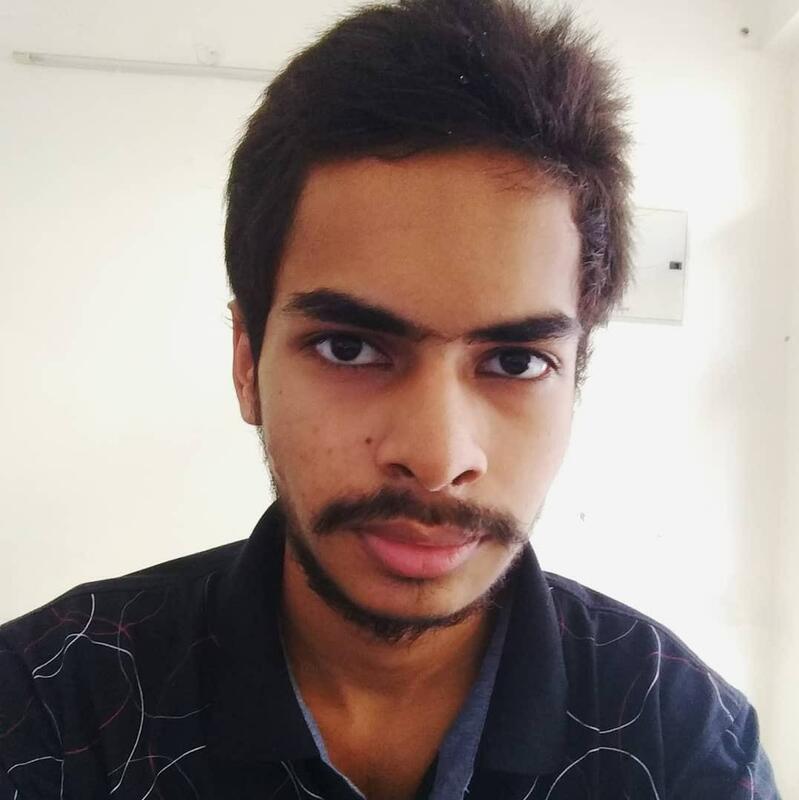 Start by visiting the Ads Manager. Once there, click on the Ads Manager menu and select “Pixels” under “Assets”. If you haven’t created a Pixel already, you’ll be prompted to create one now. Name your Pixel and click “Create Pixel”. Your Pixel code will now pop up. In order for your pixel to work properly, it needs to be displayed on every page of your website. The best place to put the code is in the <head></head> section of your index page. If you get your store, the process is much simpler. Scroll through the code and look for a string of 15 numbers. That’s your Pixel ID. Copy this number. If you need any help with your website, team at CodeCarrot is happy to help you.